A friend posted this on Instagram and it made me realize something. On the trail I started to believe in myself – that my legs were strong, that I was capable and that my heart would lead me away from danger. I felt proud of my body. I appreciated my feet and my legs regularly. I felt solid in who I was and who I was with. I was giddy and enamored with my life. It was the closest I have ever come to self acceptance. Upon being dumped back into society, I feel all out of sorts. There are endless options (for food, activities and social engagements) and not enough time or space to identify my desires. My fears of fitting in have crept back into my consciousness and I have lost the connection and trust I had cultivated with my self and my body. Now I doubt myself, my decisions and my partner. As the weeks wear on and the glamour of the trail fades, my heart aches. Initially I chalked this up to post trail depression, then thoughts that Andy and I were just too different to last. Most recently I have recognized that I have lost a sense of who I am. Perhaps it took 2650 miles to recognize that I don’t love myself. Sure I love parts of me, but I have always struggled with self accepatance. I am critical of myself, of those closest to me, and often hide from this uncomfortable truth by doing. This includes long bike rides, endless social engagements, many hours at the gym and lots of eating while stressed or anxious. This pain is now too unbearable to ignore. I am working to make myself a priority, learning how to recognize and attend to my self needs. I am not sure where this will take me but for now I feel very fortunate to have a partner that encourages self growth and acceptance. Someone who can hold onto his own truth as I grapple with mine. 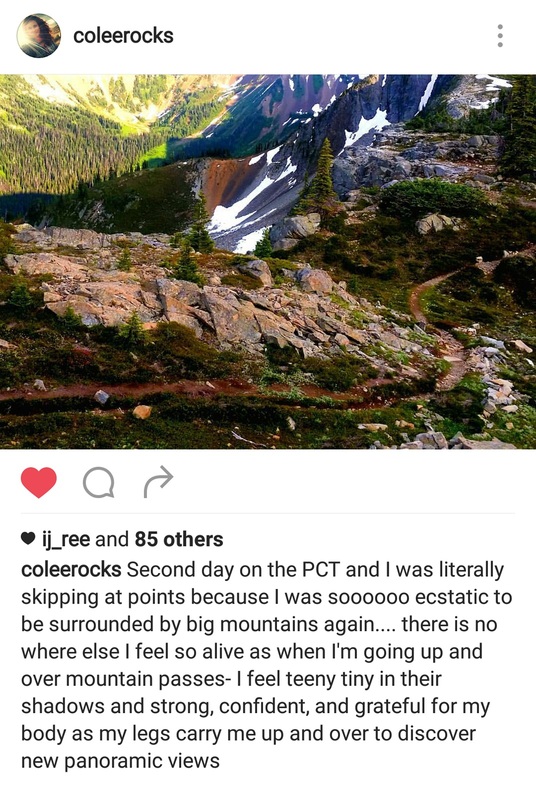 I agreed to hike the PCT because I thought it would be a fun and challenging adventure. I didn’t expect re-entry to be the hardest part. This just goes to show that often the lessons we learn are far from what we expect. The trail opened me up – it allowed me to feel and understand my potential. Apparently for me, the PCT was just a warm up, my journey has just begun. The great marketing machine is a scary thing. It’s whole purpose is to destroy your self confidence so you spend, spend, spend to fix yourself and your environment – what you need to buy to be able to do those bike rides, what you need to spend for those social engagements, and all the expenses of the gym. And what do we eat when stressed and anxious? Not cheap healthy food – that traditional comfort food makes you feel worse, costs way too much and makes you angry with yourself the next day. And run back to the gym. Perhaps it’s not as much you as your Povlov response to those constant messages from all that advertising you are exposed to now that you are off the trail. I followed your blog from the beginning and enjoyed it so much. You’ll figure it out just like you figured everything out on the trail. Thanks for following along and sharing your thoughts Linda. We really appreciate it! It’s really nice to be reminded that we will figure things out.